Dolce Vita Bar began their "All You Can Eat BBQ Buffet" last Saturday Night. 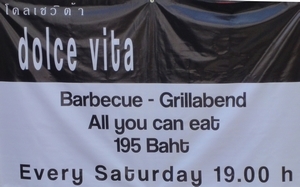 On Saturdays, at 7pm you can enjoy great BBQ for only 199 Baht!! In other Dolce Vita Bar news, they have taken over the bar next door (formerly Lubov Boys) and are expanding their Terrace Bar. Work has begun and the expanded seating will be available soon! Friday is Makha Bucha Day, one of the most important Buddhist Holidays in Thailand. Most Bars will be closed in observance. Due to Makha Bucha Day falling on Friday this year, Ganymede Bar will re-schedule their weekly Live Music Happy Hour to Saturday night.